"You see why I had to killer her, I recon. Or do you? It went like this..."
This is the first book I have read that is classified as "noir" and I didn't know what to expect. The Killer Inside Me falls under the roman noir genre, translated as "black novel". Functioning sociopath: check. Cheap woman: check. Unassuming victims: check. The Killer Inside Me is the first person account of a man conflicted between the person he thinks he should be and the killer he actually is. On the surface Lou Ford is a good-natured sherrif in small-town Texas. He speaks in cliches and says things like "gee wiz" and "oh gholly". He is a little dull and overall, quite forgettable. But underneath this facade he is an intelligent, cunning man who his hiding a dark past and doing his best to suppress his malicious tenancies. When we meet Deputy Lou Ford he seems as normal as any other small-town cop, but as his inner psyche slowly unfolds it becomes apparent that there is something very off. What ensues is a raw and somewhat obscene account of a string of murders where the innocent are repeatedly pegged as the perpetrator. Hell you’ve probably seen me if you’ve ever been out this way – I’ve stood like that, looking nice and friendly and stupid, like I wouldn’t piss if my pants were on fire. And all the time I’m laughing myself sick inside. Just watching the people. As far as narrators go, Lou Ford is a memorable one. He is well-crafted; we follow Lou as he struggles with his sickness until he eventually gives in to it completely. The reader isn't aware of the extent of his sickness until about half-way through the novel, when we realize he is only murdering people for the simple pleasure of it, fueling the killer inside of him. Upon it's publication in 1952, I can only imagine what a stir this book caused. Even though it has probably lost some of it's original shock value, I still consider it to be a sharply lurid account of the inside of a killer's mind, exposing the concerning oddities of humanity itself. How can a man ever really know anything? We’re living in a funny world, kid, a peculiar civilization. The police are playing crooks in it, and the crooks are doing police duty. The politicians are preachers, and the preachers are politicians. The tax collectors collect for themselves. The Bad People want us to have more dough, and the Good People are fighting to keep it from us. It’s not good for us, know what I mean? If we all had all we wanted to eat, we’d crap too much. We’d have inflation in the toilet paper industry. That’s the way I understand it. The unraveling of Lou's sickness was for me, the most interesting aspect of the novel. Overall I enjoyed the book, but there were parts that fell a little flat for me. With simple prose, I felt it was too straight-forward at times, as if the author didn't trust his readers to read between the lines. Of course this one isn't for the faint of heart, but the descriptions of the killings were among my favorite parts of the novel. They were suspenseful and interesting, without being overdone. Now that I have a better idea of what to expect from noir fiction, I hope to discover more new-to-me authors that can deliver. That's an excellent overview of one of my all time favorite books. Nice job! I haven't heard of this book, but it sounds like something I'd love. I'm especially pleased to see that the narrator is memorable. 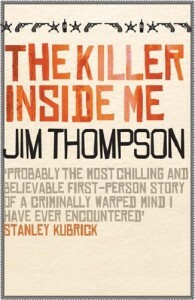 I do love books that try to delve into the mind of killers. I'm going to keep an eye out for this one now - thank you for drawing it to my attention! Have you seen the movie, with Casey Affleck? It's... brutal. It's good to see Jim Thompson get some love on a site like yours, Brenna. He did something peculiar, but it was quite unique. Big ups to you for trying something so dark. This one sounds really interesting for all the reasons that you listed. However, maybe just a little gruesome for me. You've had a great mix of reads for the challenge. I'm rethinking my own choices a little here! What a well-done review! You chose some great quotes. The movie version of the book captures that twistedness in Casey Affleck's brilliant portrayal of Lou Ford and also the soundtrack to the movie is this bright pop-country stuff which doesn't match the action onscreen. Makes you feel crazy at worst, disoriented at best. As far as Jim Thompson goes, "The Getaway" is also a good read. Great review, this book got my interest this year also, thanks for the quotes also.